This page shows you how to perform basic tasks in Cloud Pub/Sub using the Google Cloud Platform Console. Note: If you are new to Cloud Pub/Sub, we recommend that you start with the interactive tutorial. Enable the Cloud Pub/Sub API for that project. Note: You can also use the Cloud Shell to run gcloud commands without needing to install the Cloud SDK. Enter a unique Name for your topic, for example, MyTopic. That's it—you've just created a Cloud Pub/Sub topic! Display the menu for the topic you just created, and click New subscription. 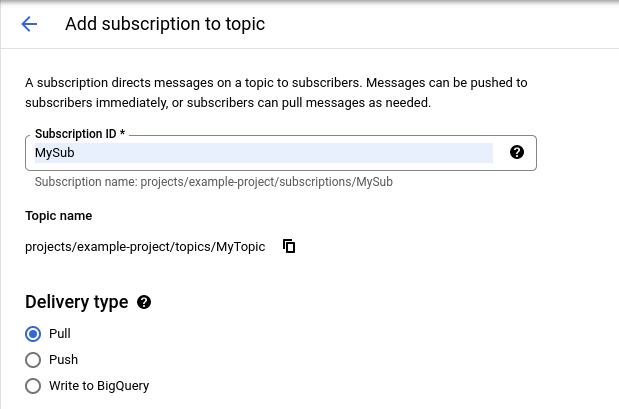 Type a name for the subscription, such as MySub. Leave the delivery type as Pull. In the overflow menu for the topic you just created, click Publish Message. Enter Hello World in the Message field. The message you sent appears in the DATA field of the command output. Get started with Cloud Pub/Sub in your language of choice at Cloud Pub/Sub Client Libraries. See the Publisher and Subscriber guides to learn more about the concepts discussed in this page. For a detailed overview of Cloud Pub/Sub, see What is Cloud Pub/Sub?